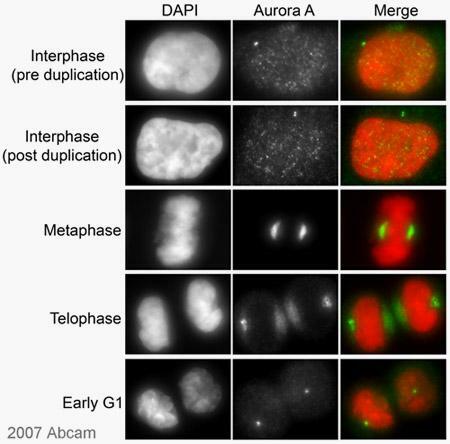 The specificity of ab13824 was confirmed by showing that it binds in ELISA to recombinant Aurora A, it detects a 46kd band on HeLa cell extract and it binds to duplicated centrosomes and spindle poles in MCF7 cells. This antibody does not inhibit the kinase activity of Aurora A. This antibody has been successfully used to detect Aurora A in the following cell extracts: 293T, HMEC, T47D, MCF7, MDA-MB-468, SK-Br-3, S68 and HeLa. Recombinant full length his-tagged Aurora A protein (Human). Human HeLa and mouse M-ICc12 cell lysates for Western blotting and human 293 or mouse LLC1 cell lines for IF. In Flow Cytometry, this antibody gave a positive signal in HeLa cells. Our Abpromise guarantee covers the use of ab13824 in the following tested applications. WB Use a concentration of 1 µg/ml. Detects a band of approximately 46 kDa. 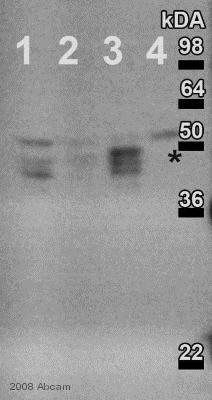 This blot was produced using 4-12% Bis-tris gel under the MOPS buffer system. The gel was run at 200v for 50 minutes. The membrane was then blocked for an hour using 2% Bovine Serum Albumin before being incubated with ab13824 over night at 4°C. Antibody binding was detected using an anti-mouse antibody conjugated to HRP, and visualised using ECL development solution. ab13824, at 1/2000 dilution, detecting Aurora A (green) in Hela Cells in conjunction with a Goat anti-mouse secondary antibody conjugated to Cy3®. Cells were fixed with methanol and counterstained with DAPI. Please refer to abreview for further details. ICC/IF image of ab13824 stained HeLa cells. The cells were 100% Methanol fixed (5 min) and then incubated in 1%BSA / 10% normal Goat serum / 0.3M glycine in 0.1% PBS-Tween for 1h to permeabilise the cells and block non-specific protein-protein interactions. The cells were then incubated with the antibody (ab13824, 5µg/ml) overnight at +4°C. The secondary antibody (green) was Alexa Fluor® 488 Goat anti-Mouse IgG (H+L) used at a 1/1000 dilution for 1h. Alexa Fluor® 594 WGA was used to label plasma membranes (red) at a 1/200 dilution for 1h. DAPI was used to stain the cell nuclei (blue) at a concentration of 1.43µM. Overlay histogram showing HeLa cells stained with ab13824 (red line). The cells were fixed with 80% methanol (5 min) and then permeabilized with 0.1% PBS-Tween for 20 min. The cells were then incubated in 1x PBS / 10% normal goat serum / 0.3M glycine to block non-specific protein-protein interactions. The cells were then incubated with the antibody (ab13824, 2µg/1x106 cells) for 30 min at 22ºC. The secondary antibody used was DyLight® 488 goat anti-mouse IgG (H+L) (ab96879) at 1/500 dilution for 30 min at 22ºC. 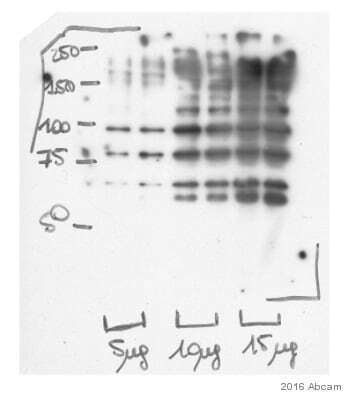 Isotype control antibody (black line) was mouse IgG2b [PLPV219] (ab91366, 2µg/1x106 cells ) used under the same conditions. Acquisition of >5,000 events was performed. This antibody gave a positive signal in HeLa cells fixed with 4% paraformaldehyde (10 min)/permeabilized in 0.1% PBS-Tween used under the same conditions. Publishing research using ab13824? Please let us know so that we can cite the reference in this datasheet. Customer inquiry about Anti-Aurora A antibody for Chlamydomonas reinhardtii. Only 67.2% identity between human and C. reinhardtii sequences. Would like a search for Aurora A antibodies with immunogen that is in a region of increased identity. We discussed potential anti-Aurora A antibodies to detect Chlamydomonas reinhardtii Aurora A. Since C. reinhardtii Aurora A has 67.2% homology with human Aurora A, this does not qualify for our AbTrial program, but a positive or negative Abreview can be submitted explaining your experience to give you AbPoints which can be used for an amount off of a future purchase or Amazon gift cards. The immunogen for this antibody is from amino acids 268-277, which has a fair amount of alignment between human and C. reinhardtii Aurora A.
Lefebvre C et al. A human B-cell interactome identifies MYB and FOXM1 as master regulators of proliferation in germinal centers. Mol Syst Biol 6:377 (2010). ICC/IF, IP; Human. I am doing IHC-P and WB; IHC-P is of mouse brain tumor of injected human tumor cells; WB of tumor cell lysate shows expected band size; IHC shows no staining; IHC used primary at 1:250; secondary is HRP conjugated. BATCH NUMBER -- NOT SPECIFIED -- ORDER NUMBER -- NOT SPECIFIED -- DESCRIPTION OF THE PROBLEM No staining at all SAMPLE normal mouse preimplantation embryos (2-cell embryo) PRIMARY ANTIBODY Aurora A antibody (ab13824) at 1:200 dilution, RT for 1 h or 4C overnight, DETECTION METHOD confocal microscopy POSITIVE AND NEGATIVE CONTROLS USED stain alpha-tubulin to show spindle. alpha-tubulin got beatiful staining. ANTIBODY STORAGE CONDITIONS -20C FIXATION OF SAMPLE 3.7% PFA at room temp for 1 h PERMEABILIZATION STEP tried both 0.25% and 0.5% triton x-100 at RT for 30 mins and 1h. BLOCKING CONDITIONS 1% BSA in PBS at 4C overnight SECONDARY ANTIBODY Goat anti mouse Alex 633 conjugated, 1: 200 dilution, 1 h at RT or 4C overnight HOW MANY TIMES HAVE YOU TRIED THE APPLICATION? 4 DO YOU OBTAIN THE SAME RESULTS EVERY TIME? Yes WHAT STEPS HAVE YOU ALTERED? permeabilzation, primary antibody incubation, secondary antibody incubation ADDITIONAL NOTES please see the attached picture. I am sure the antibody does not function. I spent a lot of time on the staining and hope to get the replacement. Thank you. Thank you for your enquiry. I am sorry to hear that you are experiencing difficulties with this product ab13824. Often it is possible to make suggestions that help resolve problems. We will happily offer technical support and in the event that a product is not functioning in the applications cited on the product data sheet (and the problem has been reported within 120 days of purchase), and if it appears that the antibody is at fault, a replacement/credit note/refund will be offered. I have looked at the protocols you used and have a few questions and suggestions that might help you determine the cause of the no staining results. I would therefore appreciate if you can please clarify the following items. Since you are using mouse cell samples, then fixation in 4% PFA should be done not more than 15 minutes, otherwise your epitopes will be masked. Also, we have a customer who previous used this product and mentions that this antibody only recognizes a centrosome associated epitope in methanol-fixed cells and does not recognize anything in a paraformaldehyde-fixed cell. Please see the abreview by Kirk McManus submitted on 19 April 2007 on the datasheet. Can you confirm that the second antibody also managed to produce good results with other primary antibodies? In some cases, the problem may be with the secondary antibody not working properly. I hope the above recommendations may already help you. If you have already tried the above suggestions and still experience problems, please do not hesitate to contact me with details of your order (purchase order number, batch number, shipping address/purchasing agent information). Also please advice me on how you would like to proceed with your enquiry, so that I can immediately arrange for a replacement or refund to you.